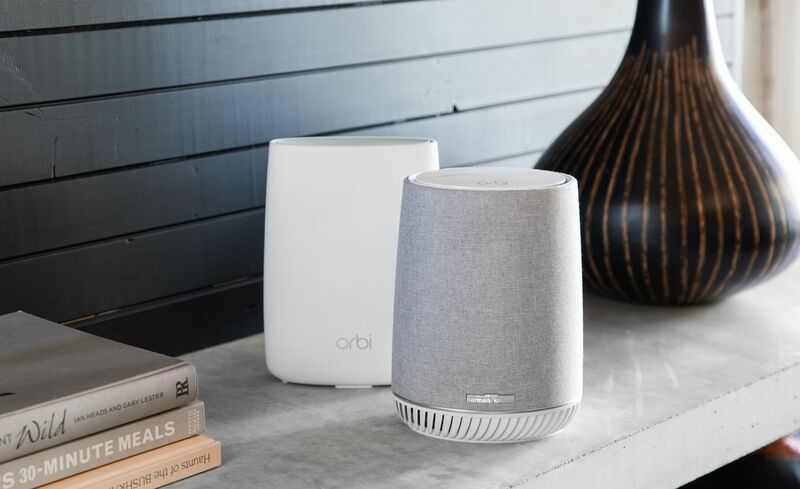 The Orbi Voice differs from the typical smart speaker in a key way: most of these speakers are designed to provide 360-degree sound, whereas the Orbi is a more traditional speaker, with a woofer and tweeter in front, as well as a bass reflect port (a chamber for bouncing the bass around). That means you’ll want to position it against a wall; but as Netgear points out, the device needs to be powered, so that’s where a lot of people would put it anyway. There are also four microphones and a series of buttons on top for controlling Alexa. Like usual, you can use it to control music playback by voice, look things up, and command other smart devices on your network. Netgear says the speaker will work with Spotify, Pandora, Deezer, iHeartRadio, and several others (including Amazon services, of course). Unfortunately, it doesn’t support simultaneous playback with other speakers, at least at launch. As a router, it should be a fairly good one. It doesn’t match the best of the Orbi lineup, but it’s still a tri-band model. Netgear says it can reach 2.2Gbps Wi-Fi speeds, and it includes two Ethernet ports. its first “pro” gaming router, the Nighthawk XR500. The new model is the XR700, and it offers up to a 7.2Gbps Wi-Fi connection. But the bigger deal for gamers will be its plethora of high-speed Ethernet ports: it has seven gigabit-speed ports, as well as a single port that supports speeds up to 10 gigabits. Netgear is positioning it as a way to power its previously announced LAN switch so 15 people can link up with gigabit connections between the two devices. The router also runs software called DumaOS that includes a bunch of customization options, as well as control over the distance of servers you connect to so gamers can make sure they’re getting a stronger connection. It also supports Plex. It’ll go on sale next month for $500.